Searching for a condo or loft in Kitchener,Waterloo or Cambridge? Here are a few options to consider if you are in the market. Situated downtown Kitchener on the corner of King and Victoria St is the Kaufman Lofts. This award winning development offers 11-13 foot high ceilings, polished concrete floors and columns, designer inspired kitchens, sliding barn doors, some units feature subway style backsplash and granite counter tops, and full featured sumptuous bathrooms. Loft sizes range from 515 sq.ft in the SOHO up to 1135 sq.ft in the Neptune. For a complete list of floor plans, see Kaufman Lofts Floor Plans. The Kaufman Lofts are built by Andrin Homes. As of this writing, there are currently 10 lofts for sale ranging in price from, 174,900 (600 sq.ft) to 289,900 (1120 sq.ft). There is also a 570 sq.ft unit available for 1,195 per/month lease. These beautiful condos are located in the east end of downtown Kitchener attached to the Kitchener Farmers Market (aka Your Kitchener Market). The developer is the Barrel Works who also built the Seagrams lofts in Waterloo. These condos are open concept in design, hardwood floors, modern kitchens with granite countertops and maple cabinetry. In-suite laundry, underground parking and use of a quiet court for get togethers with friends or family. There are units currently for sale between $194,900(864 sq.ft) to $269,900 to (1294 sq.ft). Next is a Waterloo condo development which was also developed by the Barrel Works Group along with Terra View Homes and Kiwi Newton Construction. At a cost of over 25 million to develop, there are a total of 103 loftstyle condomiums that take up a site area of over 2.3 acres. Before the buildings were built, the site was used as a distillery warehouse, housing upto 17,000 barrels of whiskey. Seagram Lofts is adaptive reuse of a brownfield site, which created residential property in the heart of Waterloo’s downtown core from two, heritage, whisky-barrel warehouses. 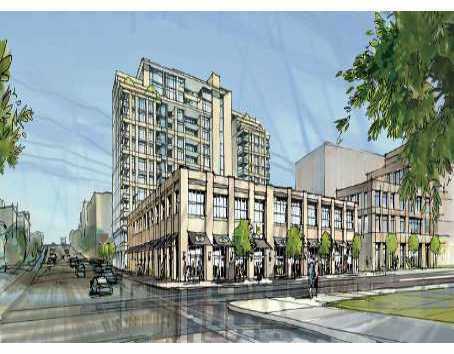 As part of downtown Waterloo’s revitalization, the project was the subject of much public interest.The project created 103 loft-style condominium units with high ceilings and large windows. Complementing these features are original brick walls and barrel-wood, evoking the old warehouse feel.” source CMHC Case Study Waterloo Seagrams Lofts case study. There is currently only one unit for sale that is priced at $359,000 and is 1260 sq.ft. A new development situated in Uptown Waterloo is the Bauer lofts. These modern lofts feature 10 foot ceilings and 8 foot high door entrances. Units range in size between 600-1200 sq.ft and larger. The Bistro-style kitchen features centre island and stylish modern cabinetry. This development blends the old with the new . All the units are almost sold out with the exception of one unit that is currently listed at $339,900 for 1265 sq.ft. They are leasing units between $1500 to $2850. For more information about these or any other loft or condo in Kitchener-Waterloo area, please contact us. We are a full-time real estate team in Waterloo Region, Woolwich & Wellesley Townships. We enjoy assisting buyers and sellers with the purchase or sale of real estate in the Kitchener-Waterloo, Cambridge, Elmira, Wellesley, Wilmot, Drayton and everywhere in between. If you would like us to help you with your home search, please check out our brand-new free search website or if you are thinking of selling, get a free market evaluation. P.S. Looking for a K-W condo or loft, check out our brand new website at www.LoftStyle.ca!